Farrier’s Finish® is a liquid hoof dressing that protects against excessively wet or dry conditions. Its non-caustic formulation helps maintain healthy hooves while supporting hoof wall elasticity. The ingredients iodine and tea tree oil give the product additional unique properties to provide protection for the hoof wall and sole. Yucca plant extract is an ingredient in Farrier’s Finish®. Stabled horses are often subjected to stalls containing varying amounts of excrement. Urine and feces produce high levels of ammonia which is detrimental to the tissues of the hoof capsule. The yucca plant extract binds with this ammonia, reducing its harmful effects. Chemicals used in the majority of commercial hoof products denature protein and destroy the protective function of the hoof. Although they will harden the hoof and make it shine, the “chemically cooked” hoof loses some of its elasticity, shock absorption, and its ability to “breathe”. A hoof wall without elasticity is more prone to cracking, and a hoof wall unable to breathe naturally cannot maintain healthy moisture content. 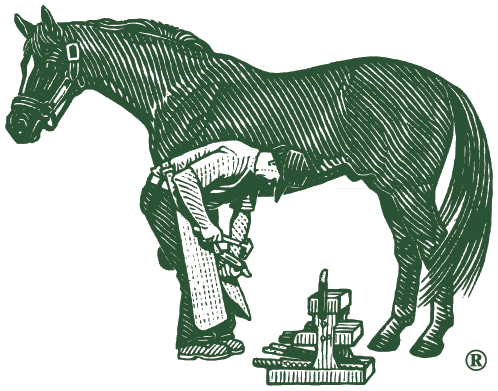 Unlike other hoof care products, Farrier’s Finish® does not utilise harmful tar or petroleum based chemicals. Farrier’s Finish® supports proper elasticity and shock absorption of the hoof wall. The ingredients iodine and tea tree oil give the product additional unique properties to provide protection for the hoof wall and sole. The natural waxes and resins help to ensure an optimum balance of moisture in the hoof capsule. The resin coating creates a barrier to moisture, thereby protecting the hoof capsule from softening during wet conditions. In dry conditions, the natural oils are retained within the hoof, lessening drying and cracking of the hoof wall. Farrier’s Finish® not only provides protection to the surface of the hoof, but it also permeates deep into the hoof cracks, old nail holes and crevices. Farrier’s Finish® is ideal for horses standing in muddy paddocks, rain-sodden fields, or overly dry environments. Available in a 473 ml (16 fluid oz) bottle.